Recently someone asked if I would do a write-up on the Post Office building. I looked on the internet and found quite a few blogs and posts already on this quite historical landmark however, my nostalgia site would probably be incomplete if I omitted it. The Philippine Postal System (PHLP) has quite a remarkable history. 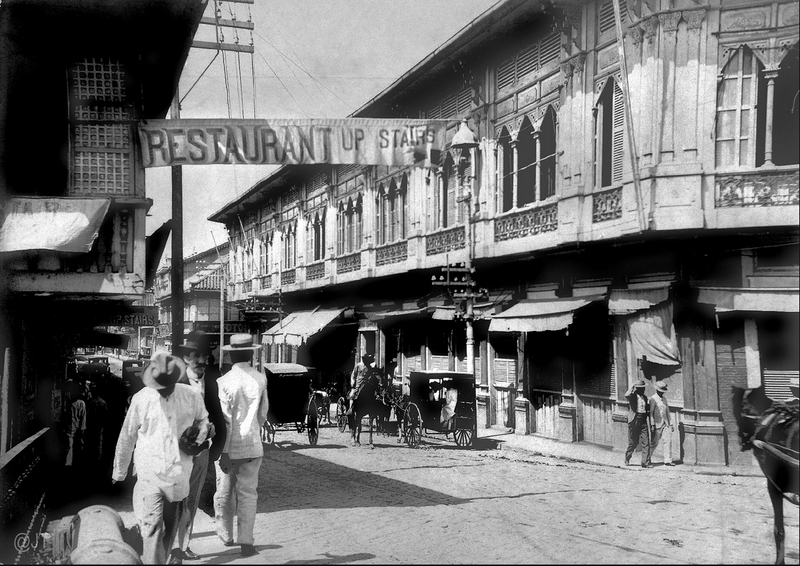 It was first established in Manila during 1767. Later in 1779, Spain managed the postal office serving the entire Philippine archipelago. As an important part of the trade route from Spain, Mexico and the Philippines, it was integral in maintaining communication between the colonies and the ruling monarchs of Spain. 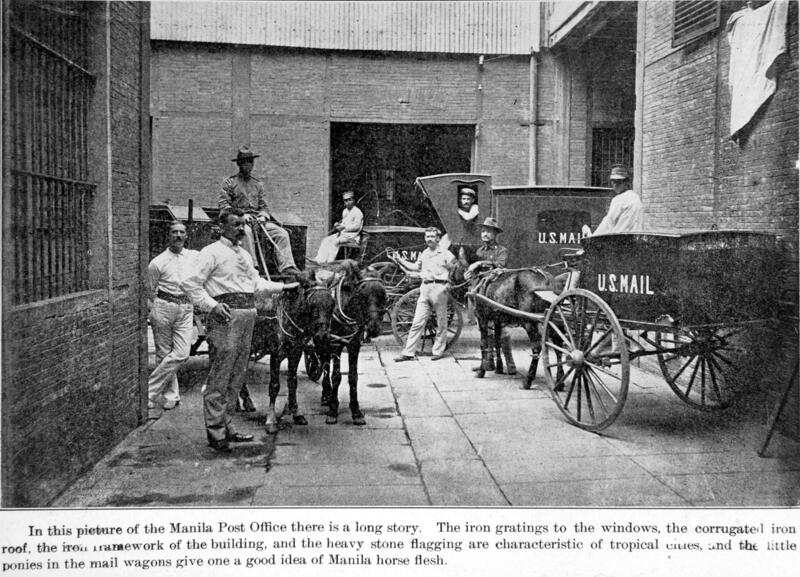 The first known location of the Manila Post Office was on the Escolta, next to the Estera de la Reina close to the Santa Cruz church. It sat in the corner of this building behind the awnings. 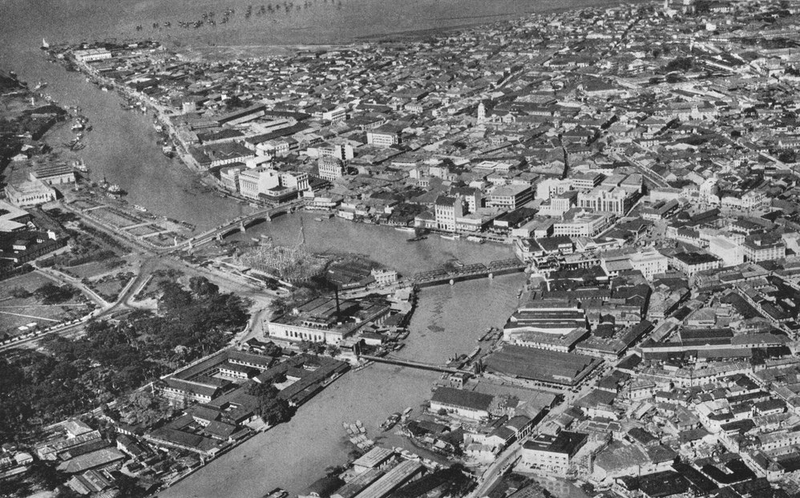 The post office was transferred to offices in the westerly part of the building complex shown below right, known as the Cuartel Fortin, located on the south side of the Pasig River by Plaza Lawton just about where the new Post Office building would be built years later. The Bridge of Spain can be seen in the middle right hand side. 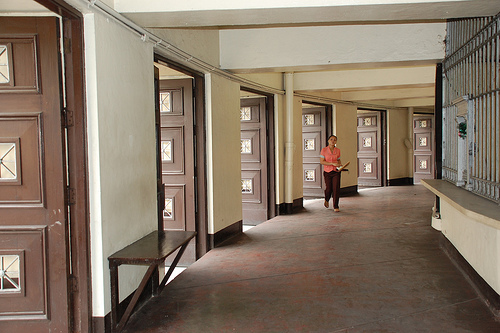 The transfer, with all the furnishings, hardwood partitions, lock boxes, etc., took place on Saturday, June 25, 1904, in the midst of a severe typhoon, and the post-office was open and ready for business the following Monday morning, June 27, 1904. 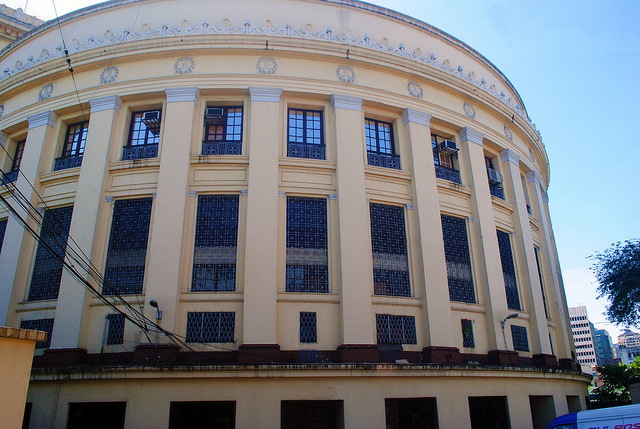 The Cuartel Fortin had been transferred from the army for the use of the insular government, renovated and fitted up for use of the Bureau of Posts. The new quarters gave more than double the working space as well as provided a larger and more convenient lobby for the public. The building sat directly on the waterfront and had a fine wharf where mail was delivered directly from launches and lighters, thus doing away with the heavy wagon transportation formerly required in handling mail from the United States. Source: Report of the Philippine Commission to the Secretary of War. By 1903, there were 391 post offices throughout the islands. 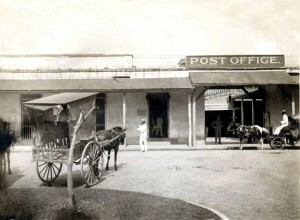 The intent was to establish a post office at the seat of government at each organized municipality. 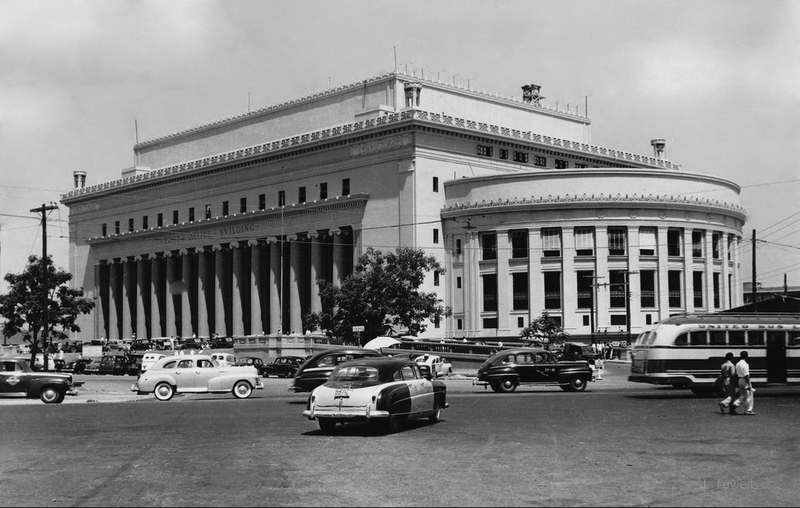 Growing up in Manila in the Fifties and Sixties and because my parents had a jewelry store on the Escolta, I would invariably pass by the Post Office building many times a week. It was and still is, a formidable and beautiful edifice. 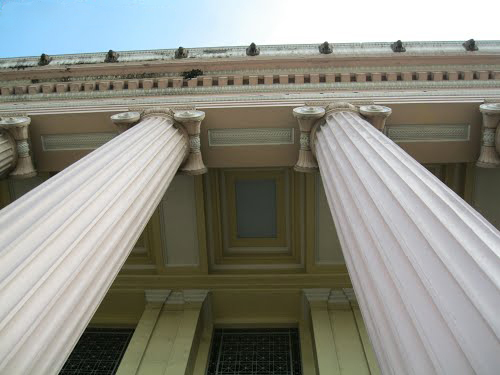 It stands as a masterpiece of the neo-classicism style with its 14 massive Ionic columns flanked by the main rectangular building and semicircular blocks adding grace to strength. You know, when you’re a kid you just don’t pay much attention to your environment – at least, I didn’t. It wasn’t until later that I truly appreciated the beauty of buildings such as the Post Office, the Metropolitan Theater, and the Legislative Building. Interestingly, all three designs involved a brilliant Filipino architect by the name of Juan Marcos Arellano. 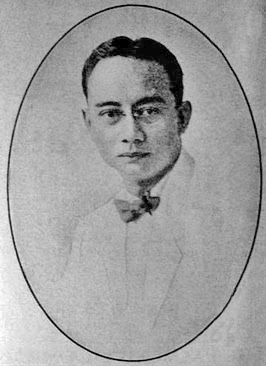 Born in 1888, he attended the Ateneo Municipal de Manila and graduated in 1908. His first passion was painting and he trained under Lorenzo Guerrero, Toribio Antillon, and Fabian de la Rosa. However, he pursued architecture and was sent to the United States as one of the first pensionados in architecture, after Carlos Barreto, who was sent to the Drexel Institute in 1908, Antonio Toledo, who went to Ohio State, and Tomás Mapúa, who went to Cornell. 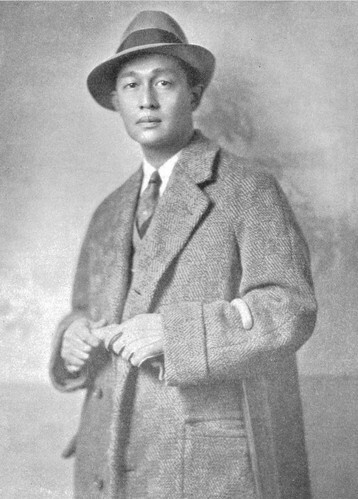 Arellano went to the Pennsylvania Academy of the Fine Arts in 1911 and subsequently transferred to Drexel to finish his bachelor’s degree in Architecture. He was trained in the Beaux Arts and subsequently went to work for George B. Post & Sons in New York City, where he worked for Frederick Law Olmsted, Jr. whose partner was Daniel Burnham, the creator of the visionary Master Plan of Manila in 1905. He then returned to the Philippines to begin a practice with his older brother, Arcadio, who served as architect consultant to Governor-General Willliam H. Taft. Juan later joined the Bureau of Public Works just as the last American architects, George Fenhagen and Ralph H. Doane, were leaving. 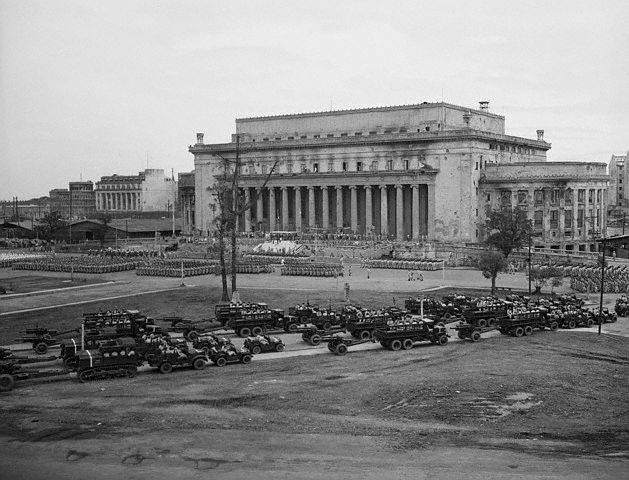 The Post Office building was designed by Doane, Tomas Mapua , and Juan Marco de Guzman Arellano in 1925. It stands as one of the grandest examples of classic architecture and the ultimate expression of American colonial architecture. It was constructed by Sta. Clara Lumber and Construction. 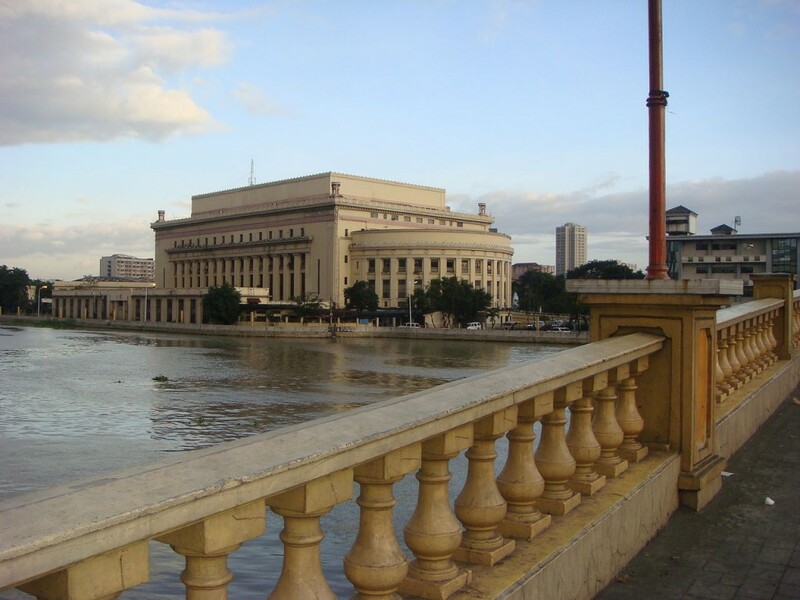 Its well-thought location by the Pasig River, flanked by Manila’s two important bridges, and at the entryway to the then broad Taft Avenue added to its scenic grandeur. 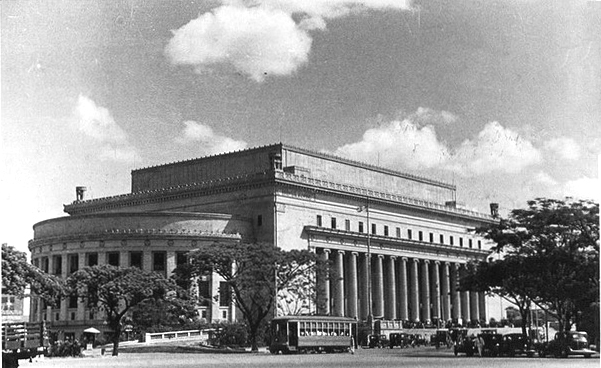 After several delays, the new Manila Post Office building was completed in 1930. Post Office under construction. Foundation is shown just past the top of the Jones Bridge. Another view from Jones Bridge looking East. 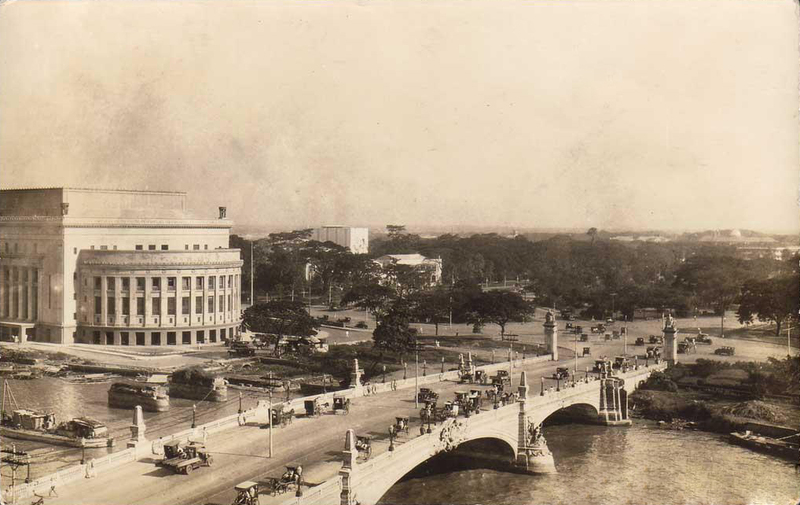 The Post Office sits at the edge of the Pasig River just across Plaza Lawton (renamed Liwasang Bonifacio in 1963). 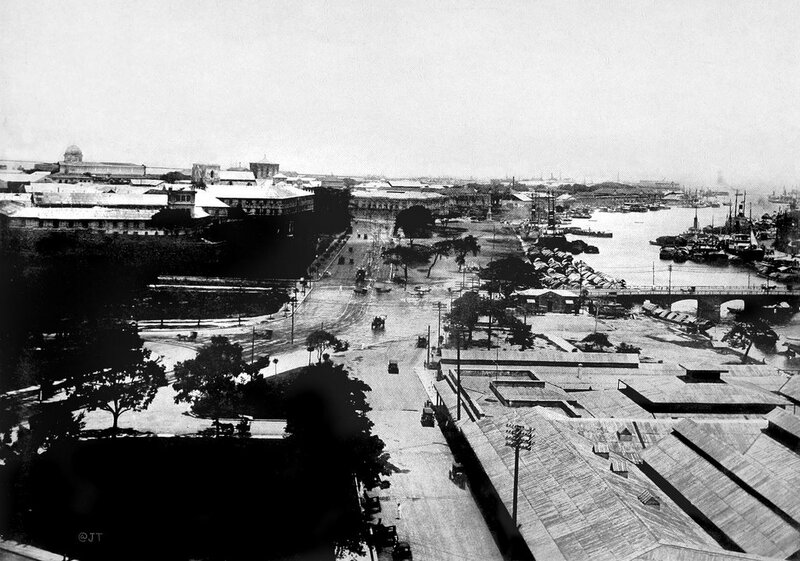 Before the war, the streetcars or Tranvias from the Port Area, Chinatown and Rizal Avenue would merge at Plaza Lawton for points north and south of the Pasig. 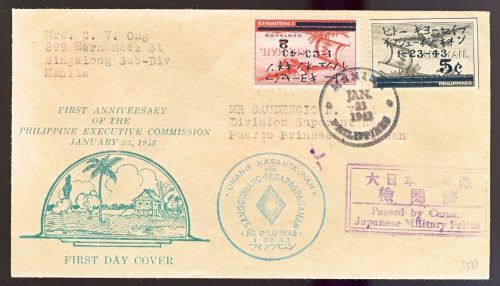 The Japanese occupation lasted from 1942 through 1945 and, although hardship ensued for the general populace, the postal service continued albeit with Japanese censorship. 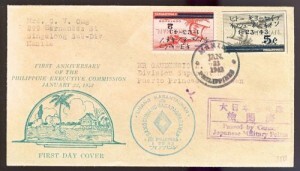 At the onset of occupation, postal service was temporarily suspended until full instructions were laid down for its reopening on March 4, 1942. Two stamps and a postal card were issued. Remaining stocks from the Commonwealth period were overprinted with black bars deleting the words “United States of America” and “Commonwealth of the”. All mail was subject to censorship until June 30, 1943. Post Office and Metropolitan Theater destroyed. Looking across the Pasig River southward. Post Office still smoking after being bombed. 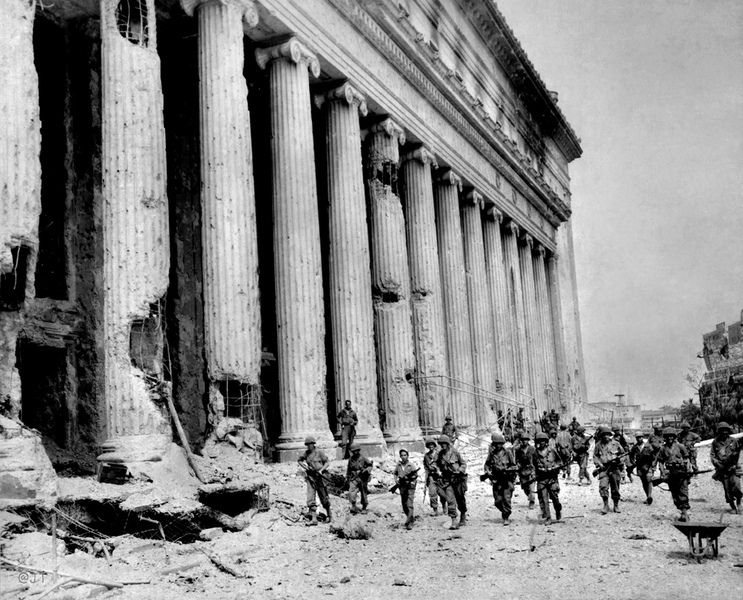 American liberators by the front portico. 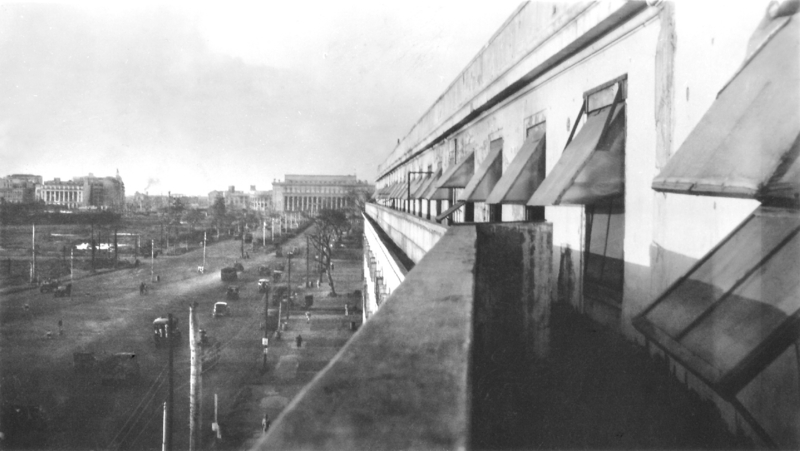 Looking northward on Taft Avenue from City Hall. 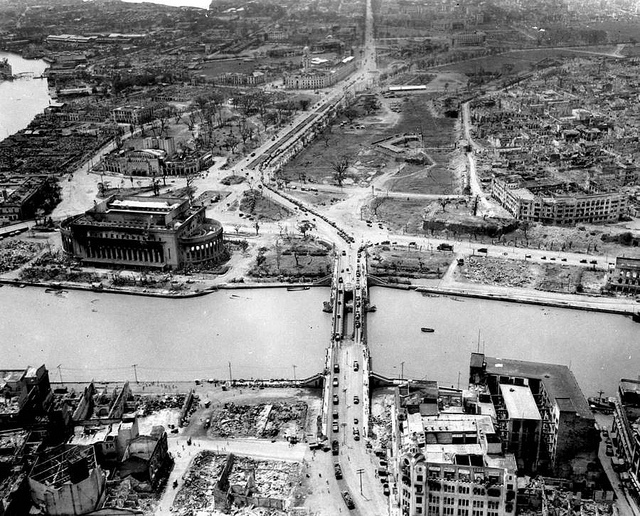 After the surrender of Japan, reconstruction began in earnest. The United States gratefully thanked its ally with eight years of free trade, generous quotas on imports, and a $400 million fund for the payment of war-damage claims. 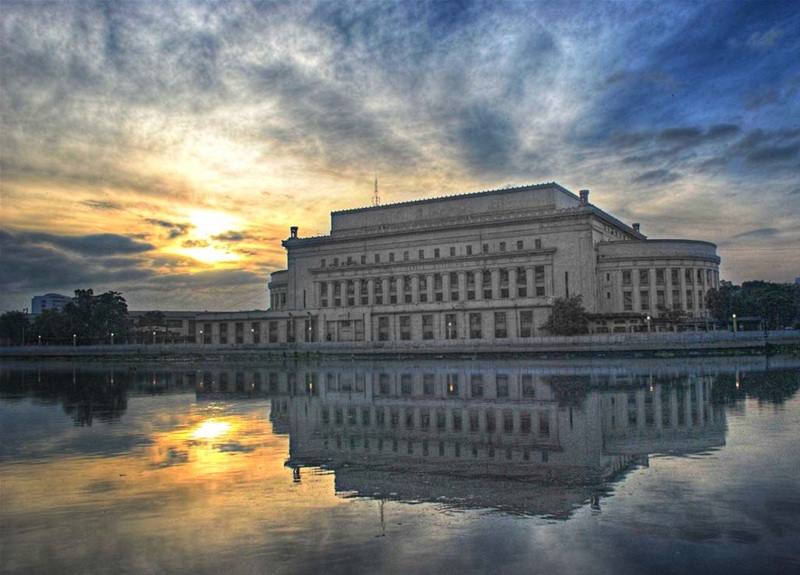 The United States also provided a $120 million public works program and turned over $100 million in surplus properties to the Philippine government. The greatest gift of all came on July 4, 1946, when the Philippines was granted its independence. July 14th, 1946.Troops massed at Plaza Lawton for a review. Business as usual. 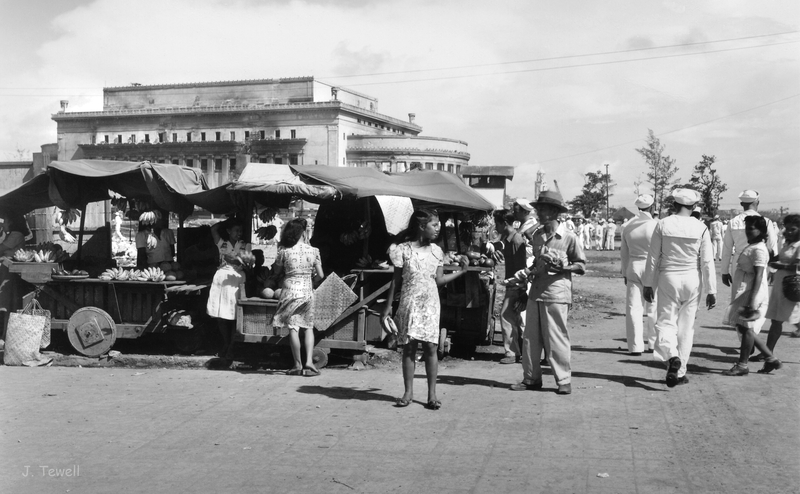 Fruit vendors in Plaza Lawton – 1945. 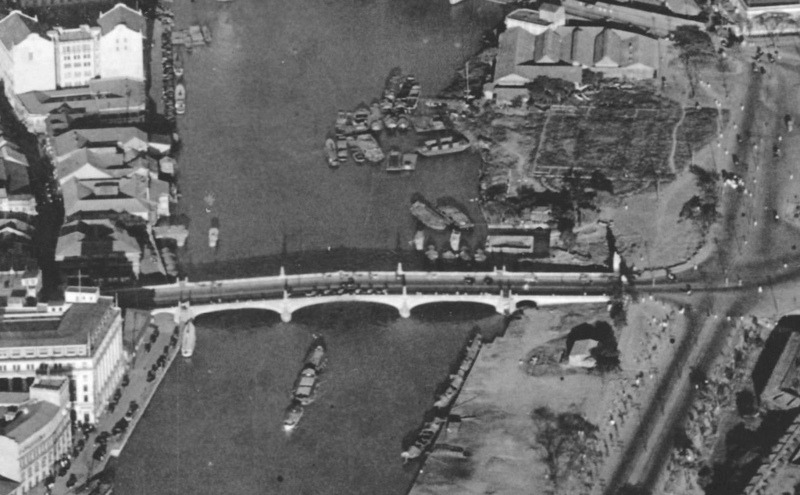 Reconstruction of Jones Bridge and the Post Office – 1946. 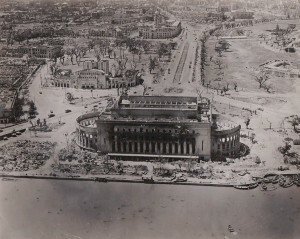 The photo above shows that most of the debris from the war has been cleared. Jones Bridge has temporary structure to allow traffic to continue and two large bodegas next to the Post Office were used to house reconstruction materials. 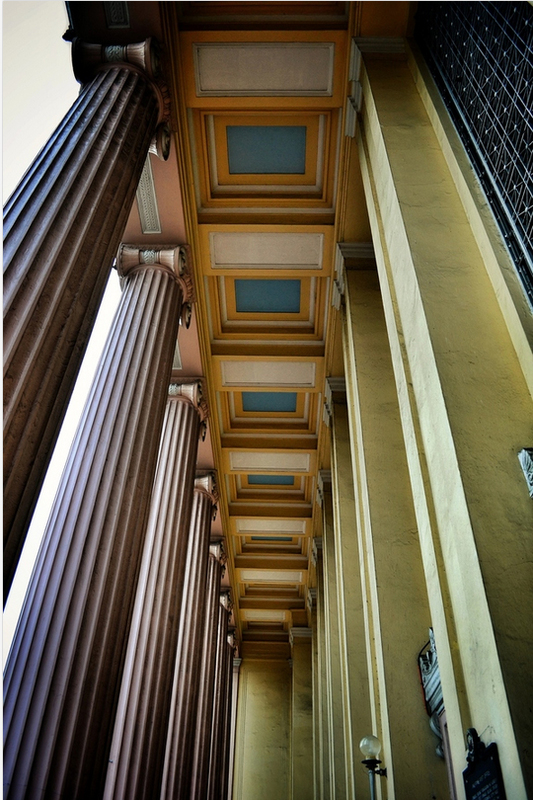 Manila regains the beauty of what was considered the pre-war “Pearl of the Orient”. The restoration of the Post Office and other government buildings attest to the hard working spirit of the Filipino people. Arellano continued his impressive career, creating a design for Quezon City in 1940, which was to become the new capital of the Philippines. 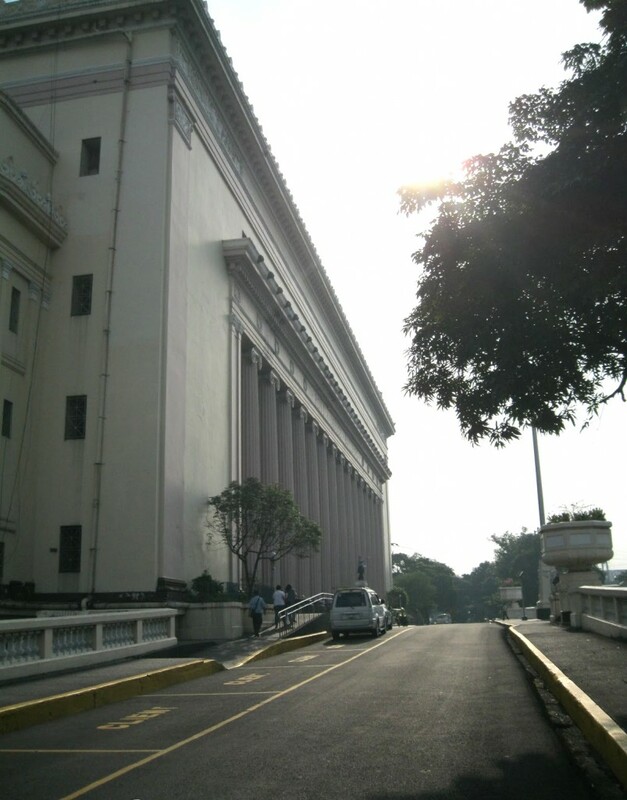 It was during that time that he also designed the building that would house the United States High Commission to the Philippines, later the Embassy of the United States in Manila. He retired in 1956 and went back to painting until his death in 1960. Lou! I enjoyed reading all the articles you’ve been writing.. Please keep writing! Thanks Sarah – it’s been fun for me to do this ! was born in 1943 grew up in Manila. Thank you. Can I ask you favor? 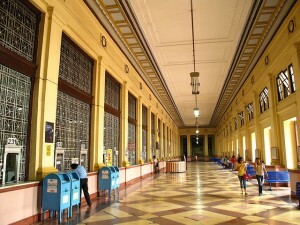 Can you please email the photo of the Manila Post Office circa 1960s? Chemistry class of 1964. Thanks again. Sir would yu have something like old pictures of KZRH AM (owned by Radio Heacock0 and later DZRH owned by Manila Broadcasting Company. thank you very much sir. Just a historical footnote. 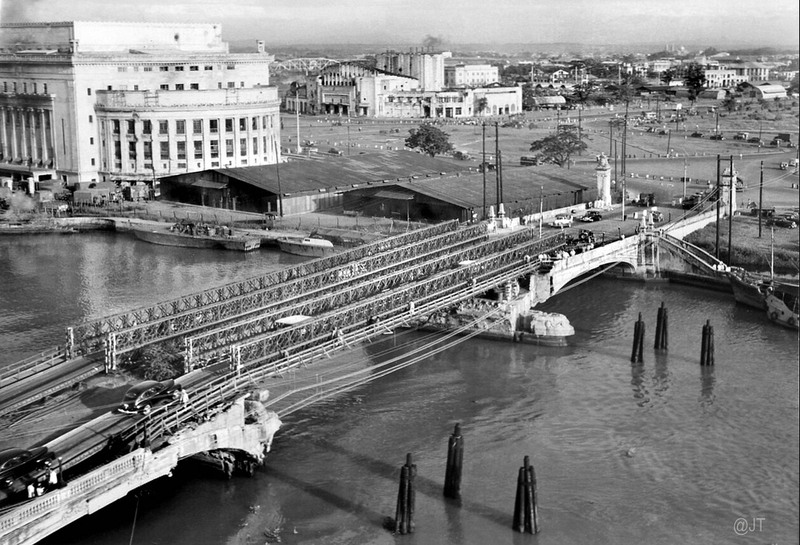 I read somewhere that the Pasig River location of the Post Office was chosen because in those days all mail was bulk shipped by boat. Napapabuntonghininga ako, nalulungkot sa nakitang kong pagkawasak ng napakagandang Maynila. Sayang hindi na ito nakita namin na ipinanganak after the war at ng mga kabataan ngayon. Ang kagandahang nagbigay ng dangal sa ating bayan na tinaguriang ” Pearl of the Orient Sea”. Ngayon sa pagdaan ko sa Maynila, ang nakikita ko’y karumihan saan ka man tumingin, mga istruktural pinapangit na ng panahon, kulang sa kalinga, kulang sa alaga. Wala bang pondo para sa maintenance ng mga landmarks na ito? Wala bang pondo para laging malinis ang palingid? Bakit pinapayagan na gawing tirahan ang mga kalye , ang mga harapan ng mga tindahan sa Abenida Riza, sa tapat ng Isetann (ba yon ?) ? Huli na ba ang lahat? Tingnan ko nga ang magagawa ni Erap. Malinis ang San Juan, sana malinis niya at mapaganda ang Maynila. God bless Manila. I’m feeling really nostalgic about old Manila since it was so much a part of our childhood days when we would visit my aunt at Hospicio de San Jose who was a Sister of Charity there. I would particularly love to see old photos of the impressive water fountain that served as the rotunda at Arlegue / Sta. Mesa Blvd./ Malacanang route (?) which survived the bombings of WWII. I was shocked to see it gone….when was that? Was it ever reconstructed elsewhere? I trust someone out there can refresh my memory of such a beauty. Was that the Carriedo Fountain ? Yes, that is the Carriedo Fountain. 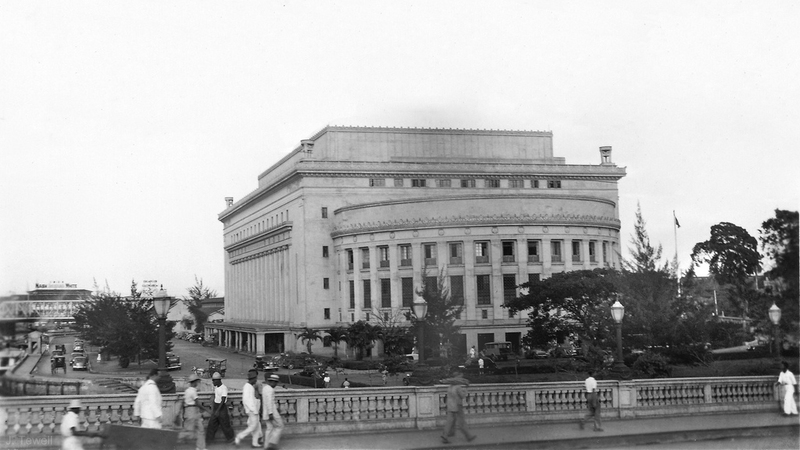 The original fountain (which was then just a cylindrical basin devoid of sculpture) was originally located at Rotonda de Sampaloc, which is now the ugly and traffic-undisciplined nameless intersection of Ramon Magsaysay (terminating point), Benito Legarda (starting point), Arlegui (starting point), Arsenio Lacson (terminating point; former Forbes), & the road (Ortigas?) towards the Apolinario Mabini Bridge. 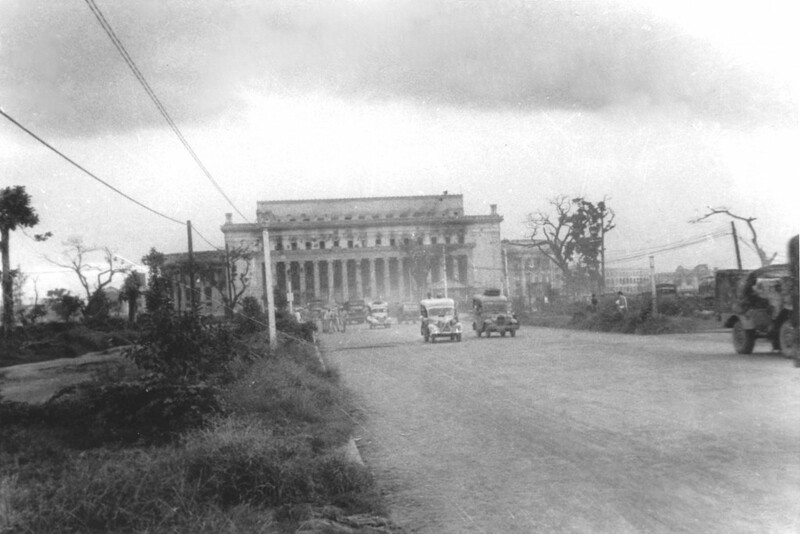 There is a reason why jeeps at the terminal at the foot of the Mabini Bridge have a karatula inscribed “Rotonda”. 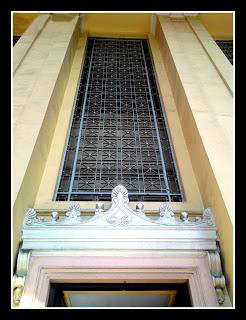 The original is now in the MWSS head office, while the uninspiring replica is undeservingly misplaced at Plaza Lacson (former Goiti). The Carriedo (Legarda, I believe) fountain has been relocated. I will check on where. Greetings from Abiva Publishing House, Inc.! Abiva is a Philippine publisher offering textbooks in basic education. Our Kamalayang Panlipunan (History) author wishes to include in his textbook the photo of old Manila featured in this blog entry (as seen in http://www.lougopal.com/manila/wp-content/uploads/2012/07/cropped-Escolta-1940.jpg). In light of this, may we respectfully request your permission to reprint the photo being referred to in the link provided. How I miss my city! Oh Manila! I hope and pray that someday in this lifetime our leaders will be able to restore Manila to its old glory. Mabuhay ang Pilipinas! Ang Perlas ng Silangan! Happy Birthday Philippines 120 years of freedom unity peace & nationhood in Southeast Asia/Pacific Rim in world history(1898-2018). Carriedo Fountain is now in the (crowed) plaza in front of Sta. Cruz Church — “downtown” Manila…no way anyone can appreciate the beauty of the fountain in this position!! It should be in Rizal Park — or another “park” — if only we had any others in Manila….I join your other readers in the dream that Manila will be restored to past beauty – but that is indeed a dream; been here 53 years (plus the two years before the war and three years in STIC) and hold little faith for any return to glory…sadly! 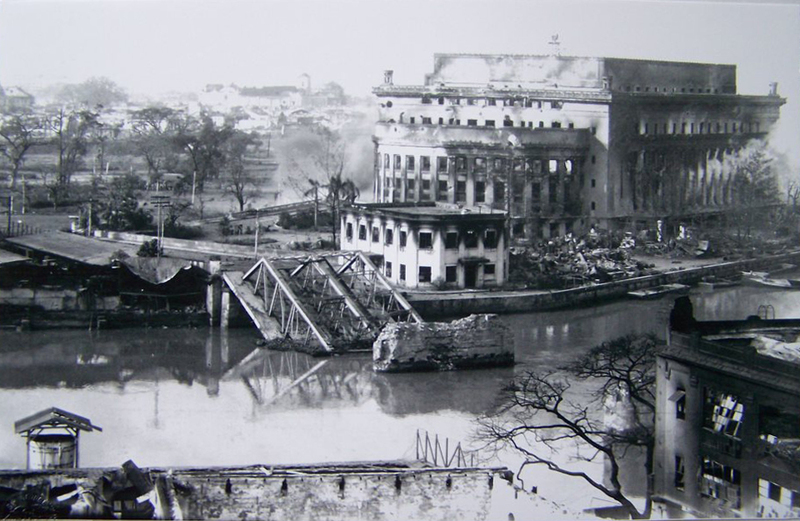 Keep up the good work Lou – and your readers might like to check availability of old Manila photos in the archives of the American Historical Collection, Rizal Library (Special Collections), Ateneo de Manila University….contact Dhea Santos, 426-6001 ext. 5567….the Collection has over 16,000 photos covering the American era in the Philippines. P.S. have heard the Post Office has been sold to a developer – said to be slated to conversion into a 5-star hotel; better clean up the river – and the neighborhood too! It sad that everything in the Philippines is sold for business. If there is a mountain, somebody builds a subdivision. I did not know that even the Post Office went the same way. I wish that one day, a leader like Singapore’s Lee Kuan Yew will rise in Philippine politics..otherwise I got not hope for the country. Hi Lou, I remember when I was a kid in late 50’s that Carriedo fountain was near Quiapo Church. It was somehow relocated to Sta. Mesa Blvd rotunda to give way for the construction of underpass in Quezon Blvd. near Plaza Miranda. 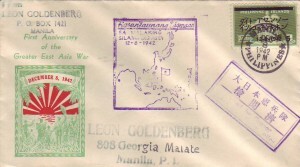 Philippine Postal Office was part of the Philippine government they used high-tech equipment air mail service & delivery services from Luzon to Mindanao & throughout the world. I love the very clear black and white pictures of old Manila. I grew up in Tondo and studied high school in Ermita. It bring back lots of memories of how beautiful and clean it was before the 70’s. 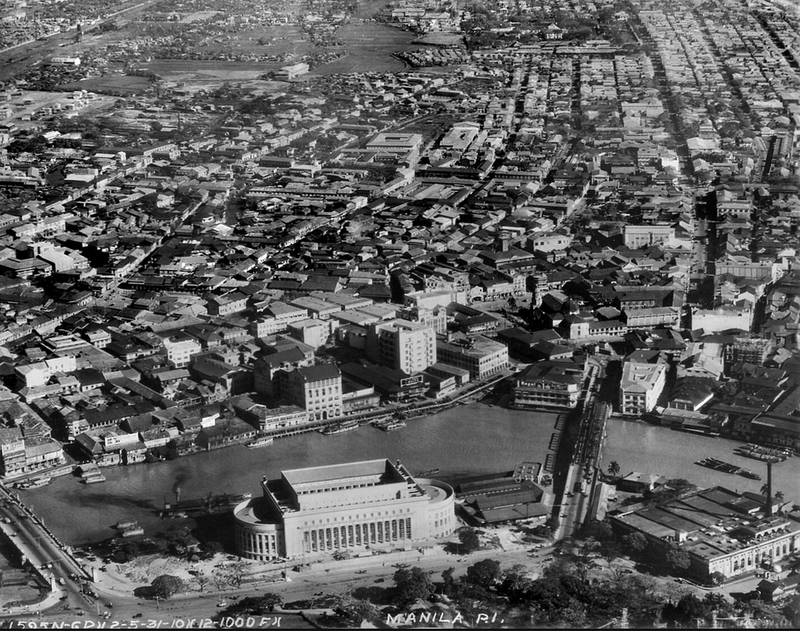 This helps me imagine living during those times and how different it is now with the lack of urban planning and the addition of the mass rail transit above ground kinda decreased its aesthetics. Thank you for caring and keeping our history. I am the big fan of world history in popular culture in TV films comics animation & media throughout the world.